Another beautiful day here in MN as we come to a near end of March. The grass has turned green (much sooner than it did last year), the flowers are starting to bloom, and leaves are starting to bud on the trees. What does that mean? The window are opened up, the kids can play outside, the birds are chirping away (though not a fan of being woken up in the morning by them) and yes, bring on the grill!!!!! Time to be inventive with cooking outside again! I love it. I love it!!!!! When I planned this weeks dinner I had no intention of grilling this. It didn’t call for being put on the grill, but I couldn’t bring myself to turning on the oven when it’s so nice outside. Turn on the grill, foiled up a pan and got my dinner going!!! 2. Sprinkle chicken with garlic salt and pepper. In a bowl combine the bread crumbs, parsley and 2 tsp oil and mix well. 3. In a large skillet add the remaining extra virgin olive oil and turn on to med-high heat. Cook the chicken until browned on both sides, about 2 minutes per side. Move the chicken to the baking sheet (sprayed with cooking spray) and spread cream cheese over the top of each piece of chicken, add the Swiss Cheese and top with the bread crumb mixture. Sprinkle the chopped ham over the top and bring it on out to the grill. 4. Bake chicken until it’s no longer pink on the inside (which I never check because I don’t want to lose the juice inside) or it reaches a temperature of 165 degrees. This chicken was so tender and full of flavor. It was just as the title says….Quick! 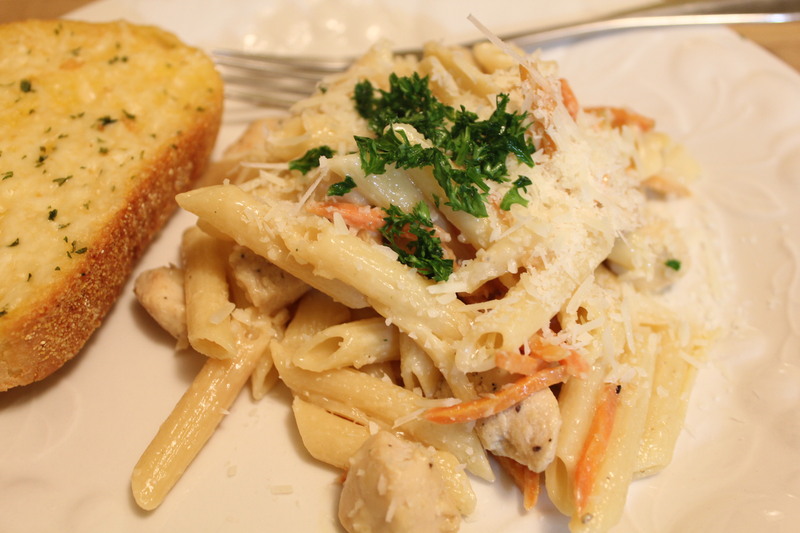 There are so many different ways to make chicken and to make it with great flavor. We eat chicken at least a couple times per week but it’s never the same way. I was going to make this dinner one night that Craig was gone bowling. But things changed and it just so happened he had to eat it! He’s not a fan of carrots, which is why I said I was going to make it when he was gone. I gave him the option to pick them out (and I think he did for the most part), but this was a hearty, close to comfort food meal. I also left out the onion because I’m the only fan of them in the house. I think it would have had given it more flavor but it was still a good pasta dinner. Easy to make, kids ate it, Craig ate it and there are left overs for me to have for lunch this week! MEANWHILE, heat 1 tsp. oil in large skillet on medium-high heat. Add half the chicken; cook and stir 2 min. or until lightly browned. Remove from skillet; cover to keep warm. Repeat with remaining chicken and 1 tsp. of the remaining oil. Add remaining oil. carrots, onions and garlic to skillet; cook and stir 3 min. Return chicken to skillet; cook 2 min. or until done, stirring frequently. Remove from heat; cover to keep warm. DRAIN pasta, reserving 1-1/4 cups of the cooking water. Return pasta to pan. Stir in reserved water and Singles; cook and stir 1 min. or until Singles are completely melted. Add chicken mixture; cook and stir 2 min. or until heated through. Top with Parmesan and parsley. It seems, lately, that every time I’m in the kitchen cooking, the kids come in and say “gross”. Doesn’t matter what it is. I’ve grown used to it at this point. They have a choice. They can eat what I make for dinner or they can make a sandwich to eat. Brooklyn has only done that once. Not sure if it’s because she doesn’t want to make it herself or because she actually likes what I make. She did go back for 2 more helpings. I may have a good dessert for tomorrow depending on time! I took out salmon for lunch today. I was going to make it the same way that I had the last time, but thought there has to be a different way to make this. Last night for dinner I had made the Panko Pork Chops, so I thought, huh….I bet I could put Panko bread crumbs on this as well! I did find a recipe on Simply Recipes, I just modified it a bit! I put some Dijon Mustard, put it on a plate and mixed in some parsley. I lined a baking sheet with foil (sprayed with cooking spray) and put the salmon skin side down. I added some salt and pepper to the salmon. 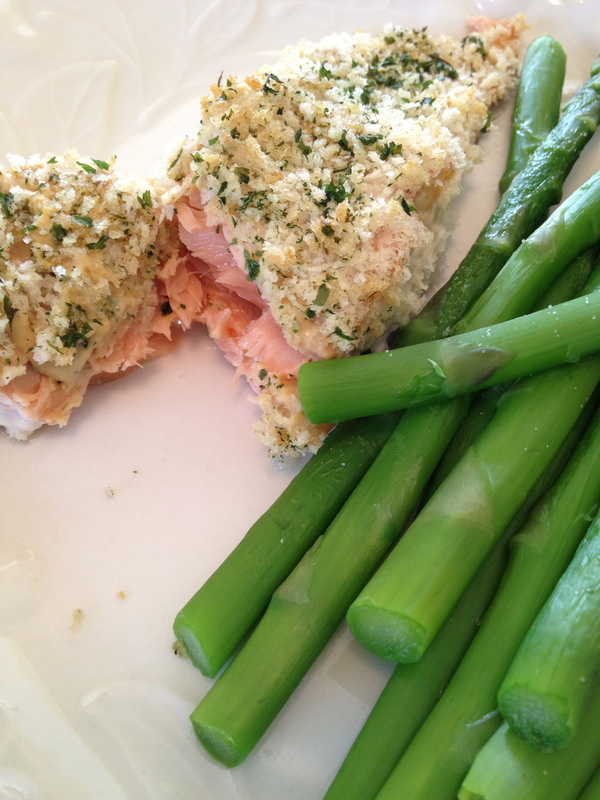 I covered the salmon with the parsley/mustard mixture and then poured the Panko Bread crumbs to cover the entire salmon. I sprinkled a bit more parsley on top and sprayed it with more of the olive oil cooking spray. I set the timer for 10 minutes and checked on it. It didn’t feel quite done yet so I bake for another minute or so. It should be firm to the touch. I had left over asparagus from dinner last night that didn’t get cooked (since Brooklyn and I are the only ones that eat it!) so I put this in a pan with water and steamed it for just a few minutes. Simply Recipes stated this: Panko is a Japanese type of bread crumb that is especially light and crunchy, popular these days with chefs because it doesn’t get soggy. What I love about this way of preparing salmon is that the panko topping seems to hold in the salmon’s moisture while roasting, so the salmon doesn’t get dried out at all. The salmon is perfectly moist, flakey, and seasoned. I have to really agree. The salmon was very moist compared to pan frying it like last time! Good and healthy lunch. This is something that I do have to make for myself as not everyone has the same pallet in our house! Nothing I haven’t already said before. Have a great rest of the work day! This was my lunch yesterday! I have the pleasure of working from home. There was a point where it was so much easier for me to get in my car and go out for lunch every day. Not only does that become expensive, but it became unhealthy as well. I’ve talked a lot about doing my best to eat healthy; watching my fat and sugar intake. Because I have a family that has a picky pallet, I struggle at times with new foods to try. I also have a hard time trying to come up with things to eat for lunch that are good for me too. I co-worker of mine had mentioned one day that she was making herself some salmon for lunch. Since I can’t have make this for everyone at dinner time, I decided to give this a try for lunch. This was quick and easy and the flavor was amazing. I bought a pack of Market Pantry (from Target) Wild-Caught Alaskan Keta Salmon (all natural). I think the entire bag was under $10 for 6 individual wrapped bags. I pulled out a frying pan, filled it with some extra virgin olive oil and turned the heat on medium-high. I let the pan get hot and put the salmon in skin side down. While that was cooking I put together the butter sauce (which I’m actually thinking could be used with extra virgin olive oil as well next time). Melt the butter in a small saucepan and stir in the lemon juice, garlic and parsley. Blend well and stir over low heat for several minutes. 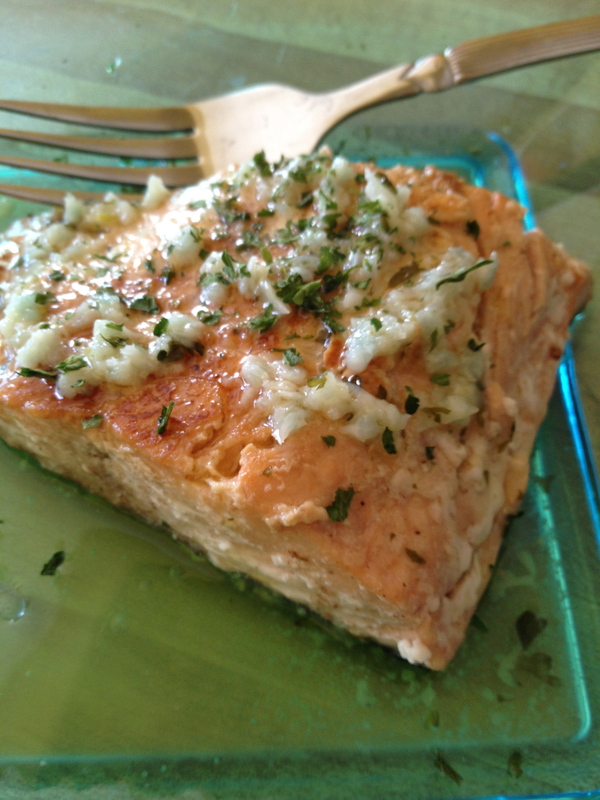 Serve with the baked salmon. Because of the butter in this sauce, I didn’t use the entire amount. But the garlic and lemon together was amazing. This was so good. I will definitely be eating this again for lunch. (Now if I could get the family to eat this as well). No more salads every day for lunch for me!